Waiting for my superpowers to kick in. I got bitten on the neck by some kind of insect. And now I’m just waiting for my superpowers to kick in so I know what kind of bug it was. 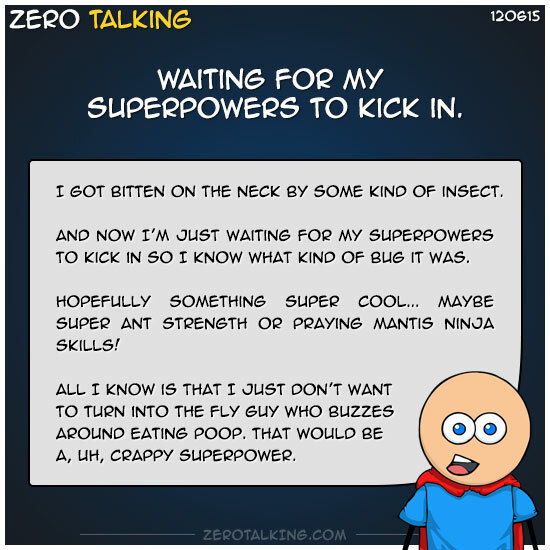 Hopefully something super cool… Maybe super ant strength or praying mantis ninja skills! All I know is that I just don’t want to turn into the Fly guy who buzzes around eating poop. That would be a, uh, crappy superpower. See the comments on Facebook. Body. Mind. Soul. And Love.